It just takes a couple of treat breaks and all of a sudden you are behind the 8 ball on reviews again. I do my best not to mix treats, but sometimes we break open a new snack but I dont get to write about it. Case in point is this weekend were we dug into two new caramel Breyers treats and now I need to review them both (seperately). 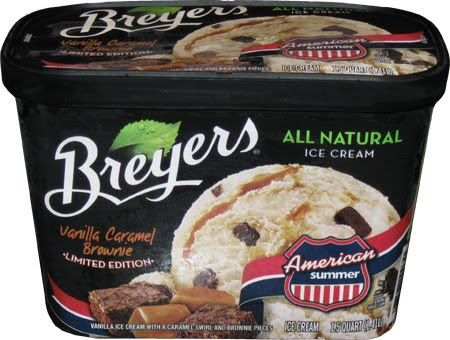 First up is one of the Breyers American Summer flavors. I'm not in the mood to try grasshopper pie, but I was more than willing to see how Breyers handles brownie chunks.... let me reiterate that, and think about it while I do: try naming a Breyers flavor that has brownies in it? Drawing a blank? I certainly am, but how can that be? Not a single flavor? Ok, I just found Vanilla Fudge Brownie, but that's it, and I'm not even sure I've ever had it. Can Breyers bring the all natural brownie love with any success? 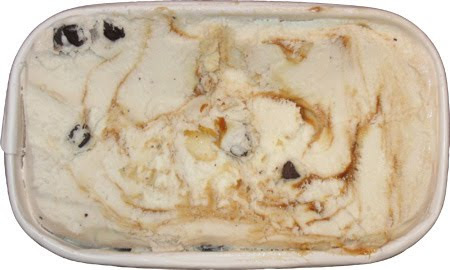 Let's find out with Limited Edition Vanilla Caramel Brownie. It's vanilla ice cream with a caramel swirl and brownie pieces. Sounds decent. And here is the money shot, or is it? We've got a half dozen brownie pieces in sight, which isn't bad, but it's not overwhelming either. The caramel swirl is all over the place. It's ok I guess, but not really wowing me yet. I know it's not the greatest picture, but I had to show off the brownie pieces which look more like little shiny brown rocks. They definitely aren't inspiring any confidence here. We dig in and it's... ok, nothing real special. It's not bad, it's all natural, and it's not a heavy ice cream, but it's not really wowing me. I was hoping for more from the brownie bites. They aren't really bringing any major flavor to the show and for me BROWNIE is the key word in Vanilla Caramel Brownie. Actually, it should go more like Vanilla (caramel) BROWNIE. That's better. Yeah, not feeling a whole lot of other words springing to mind here. On Second Scoop: I've been dying for ice cream for the last few hours, so let's dig in....and immediately I'm searching for brownie bits to see if I was too hard on them. I'm sure this will sound simplistic, but they just aren't big enough. You know, I would love to see this as a pint flavor but with giant brownie chunks. If fat is an issue, use some applesauce instead of oil in the brownies (again, simplistic, but you get the idea). A pea sized brownie bit just doesn't do anything for me. That's not true, it does do something : It frustrates me. Conclusion: Not awful, but could be so much better. I'm thinking the vanilla fudge brownie version is more satisfying. Update: This limited edition flavor never came back.